Chop the celery stalks, chop the cherry tomatoes in half, dice the cheese. Steam the vegetables (broccoli, mushrooms, and celery) for a couple of minutes. They should still be a bit hard, not totally cooked. 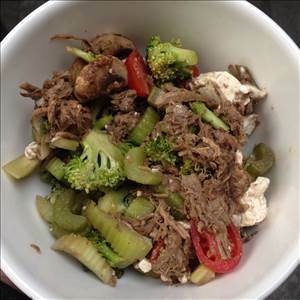 Mix the steamed vegetables in your serving bowl along with the cherry tomatoes, cheese and shredded beef. Dress with olive oil and balsamic vinegar. Add any pepper if desired. There are 488 calories in 1 serving of Beef Salad. Calorie break-down: 71% fat, 9% carbs, 20% protein.